ICY DOCK’s EZConvert MB882 series can convert most of 2.5” SATA and SSD hard drive into a 3.5” SATA drive. It has enough ventilation to keep the 2.5” drive cool and can protect your drive. Installing a 2.5” drive requires no screws or tool whatsoever. Whether you use a SATA or SSD drive, you will maintain the transfer speed while using this case. With this converter, mounting a 2.5” drive into a desktop will be simple without having to purchase any special attachments or systems, allowing more convenience in recovering data from laptops or OS boot up onto a desktop. 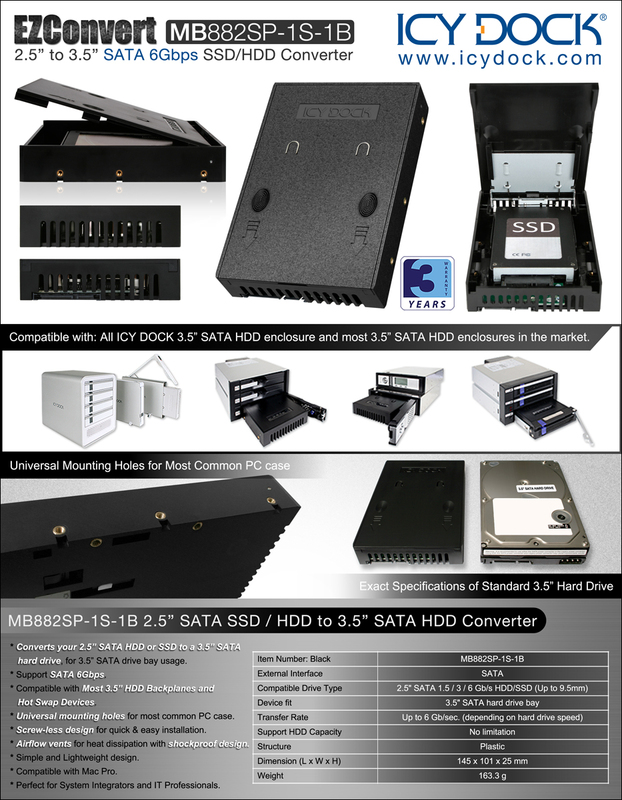 Mostly, it is designed to fit into most common PC cases, 3.5” HDD duplicator, 3.5” SATA HDD enclosure, mobile rack, backplane modules and servers without having to purchase any attachments for the 2.5” drives. This state-of-the-art case will revolutionize the way 2.5” drives are presently used. Overall, a sturdy, reliable construction with easy access to the drive, perfect for system integrators and IT professionals.